Can the sale of ping pong tables foretell Silicon Valley’s future? Tech startups. Some investors just can’t wait to hear the latest news from Silicon Valley’s field of dreams. I understand. No one wants to miss out on the next big thing. But then, like me, you’ve probably never been the CEO of a Silicon Valley startup. That’s because we came of age before the Internet conspired to create moguls out of people who found innovative ways to facilitate information and technology. What does any of this have to do with portfolios? First, a little background. A 20-something wunderkind has an idea that could forever alter the social media landscape. The idea is so enticing, in fact, that she pitches a pool of eager venture capitalists, and is actually able to raise several million dollars from investors. With the help of a well-connected commercial agent, she leases 20,000 square feet of recently vacated real estate in the heart of Silicon Valley. She then furnishes this massive space with designer cubicles, big screen televisions, finely-worn leather sofas, and, last but not least, a half dozen ping pong tables. A half dozen $2,300 ping pong tables with investors’ money? 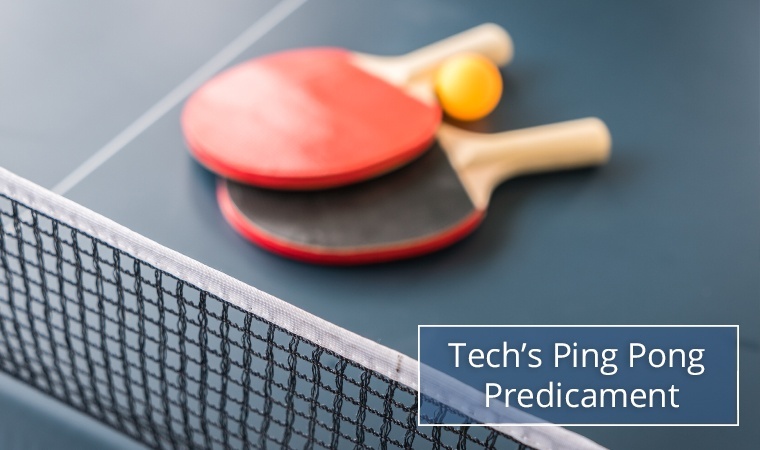 In the modern era of Silicon Valley (including San Francisco), the purchase of ping pong tables is actually considered a baseline for credibility. “If you don’t have a ping pong table, you’re not a tech company,” said the CFO at Lithium Technologies in San Francisco. Are dark days ahead for Silicon Valley? What could it possibly mean then, when according to a May 4th Vanity Fair survey of the two biggest game retailers in the Bay Area, that ping pong table sales have plummeted by 50 percent in the first quarter of 2016 (compared to 2015)? Perhaps nothing. And while it would be silly to predict the fate of an entire sector (tech) based on something as anecdotal as the rate of sale of ping pong tables, consider that, according to The Wall Street Journal, Silicon Valley has seen a 30 percent “shadow” decline in venture capital deals throughout the Bay Area over that same period. While I have no inside knowledge as to whether or not the tech bubble is ending, from the dotcom bubble implosion of 2000, to the burst of the housing bubble in 2008, it has always been my philosophy, and the philosophy of Hanson McClain Advisors, to be extremely suspicious of trends that lead to emotional investing. Fun, exciting ideas—things having to do with social media or cool new gadgets—these rocket ships attract media, but they also have a way of running out of fuel in spectacular fashion. In fact, a December 2nd, 2015, article in Wired magazine listed the 10 biggest (and most recent) Silicon Valley flameouts, and noted that, between them, these 10 companies had raised over $2 billion in venture capital. Simply being popular or well-financed is no guarantee of success. No matter what happens in Silicon Valley (or wherever $2,300 ping pong tables are sold), portfolios should be allocated in such a way as to protect investors from the worst aspects of behavioral finance. And this includes, but is not limited to, bubbles created by exciting trends in information and technology.